Adam Scott heads up a quality field of major winners and past champions in Honolulu as the PGA Tour returns to Waialae for the 2014 Sony Open. Everyone is on the Zach Johnson love train it seems, and that’s not completely ridiculous after the display he put on last week at Kapalua for his 11th PGA Tour win. Based on his current form, and as a past winner at Waialae, he is clearly a serious threat this week. If he can win here this week, he’ll be the second player ever to win both legs of the Hawaiian swing, joining Ernie Els who did so in 2003. Outside of that, the field is of better quality this week than it usually is, or at least it seems that way. Six of the top-25 players in the Official World Golf Rankings are present, with the five players mentioned above being joined by Japanese phenom Hideki Matsuyama. In addition to those six, a group of steady PGA Tour veterans like Charles Howell, Tim Clark and Jeff Overton along with newcomers from the graduating class of the Web.com Tour will fill out the rest of the field. Much like we saw last week at Kapalua, the scenery around Waialae is usually pretty impressive and it’s a very familiar venue, having played host to this event every year since 1965. Last year, the course played far easier than it had in previous years, mostly because of a lack of wind, which is usually the central defence for the course. Rookie Russell Henley took advantage of the conditions, firing a course record 24-under par 256 for his first PGA Tour win and besting Brad Faxon’s mark of 20-under par 260 back in 2001. The good news for the players is that the conditions look to be pretty similar with minimal wind and rain in the forecast. The key hole will likely be the finisher, a par-5 measuring 551 yards. In each of the last five years, it has either been the easiest or the second easiest hole on the course, playing between 4.32 and 4.71 strokes. Isao Aoki became the first Japanese player to win on the PGA Tour by holing out on the 18th back in 1983. 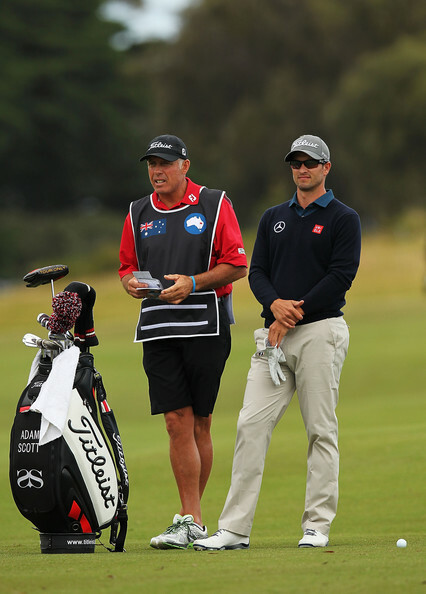 Adam Scott: So, Scott is on a pretty good run, huh? Five straight top-10 finishes, including two wins and even though he didn’t look great at Kapalua last week, he still got into a tie for sixth. He can make it look that easy, I guess. He’s been pretty inconsistent at Waialae though in his career, finishing as the runner-up in 2009, but also missing two cuts among five total appearances. Zach Johnson: As mentioned above, Johnson did win here back in 2009, and coming in off of a win, he’s definitely hot. The problem is that he’s also been pretty bad here too, with his best finish in the last three years being a tie for 54th with the other two appearances yielding missed cuts. I also really don’t like taking guys going for back-to-back wins, it’s just too difficult to do. Matt Kuchar: Much like Scott and Johnson, Kuchar comes in here playing quite well, with four straight top-10 finishes and also like the above two, Kuchar also has a wildly inconsistent track record at Waialae. He’s made ten appearances, with six missed cuts, three top-5 appearances and a tie for 65th. That’s not something we’re used to from Kuchar, but in fairness to him, he has finished inside the top-5 in each of the last two years. Jordan Spieth: Spieth hasn’t played Waialae before, but that didn’t seem to get in his way last week in his first ever visit to Kapalua where he finished as the runner-up to Johnson. If the wind is down like it is supposed to be, scores will be low and there are few in the field that can go low like Spieth. Jason Dufner: Dufner quietly went about his business last week at Kapalua, as he usually does. When most of the stories written about him were about his need to watch Auburn in the BCS Championship game, he had a pretty quiet solo fifth, and with his talent, he’s always someone to watch. His track record at Waialae though? Not so good, with no top-10 finishes in six appearances from 2004 to 2012. When you talk about underachievers in golf, Howell is near the top of the list, without question. For someone as talented as he is, two professional wins and one top-10 in his major championship career is utterly confusing, but it’s hard not to like him at Waialae, where he always seems to play well. This will be his 13th appearance in the tournament, and he has finished inside the top-5 seven times, including each of the last two years. In his 46 rounds played at the course, he’s been under par 34 times. If he’s going to pick up his third career win, this is the spot for him to do it. I mentioned above that the field is better here than in the past, but it still isn’t at the level of many tournaments that you’ll see later in the year, which is why I can’t understand the current odds on Matsuyama, which are currently hovering around 35 or 40-1 depending on the book you use. I know he’s missed the cut in three attempts at Waialae, but he won his last start in Japan, and his recent showings on the PGA Tour have all been solid, so if you’re going to give me him at this price, I’m going to jump all over it. Many American fans and writers won’t believe me, but this kid is every bit as good as Spieth with about half of the attention. de Jonge hasn’t been outside the top-16 since the CIMB Classic in October, and I think just about everyone who follows golf closely is expecting him to break through with that first PGA Tour win very soon, as he’s just too good of a player to go through another winless year. He doesn’t have the best track record at the course, but his T10 in 2012, including a second round 62 tells me that he can play well here. With all of the focus on Matsuyama, it’s been relatively easy to forget about Ishikawa, who was in the exact same spot just a few years ago, but after some tough times, it looks like he’s turning things around. Since earning his tour card back, he’s posted five top-20 finishes in his last eight starts and based on the stats, he’s been striking the ball extremely well. His lone appearance at the course yielded a missed cut, but I’m not paying too much attention to that. I like him to crack the top-5 this week. Obviously Cink is a bit of a long shot here, but he’s had some success at Waialae, albeit almost a decade ago. Cink looked pretty good at points last year but just couldn’t stay consistent, and it’s really difficult to believe that his last win on tour was that 2009 Open Championship. It probably means very little, but he did look very good at the PNC Father/Son Challenge, winning with son Connor, and he will be well rested coming into the week. At this price, it’s worth a flyer.